German yard Lürssen has won the contract to carry out a year-long refit on Oceanco’s mammoth 110 metre superyacht Jubilee. The extensive refit will get underway in May and will be overseen by Burgess Technical Services, with a scheduled re-delivery date of May 2020. The news comes after the motor yacht was sold in November 2018. Built in steel and aluminium by Dutch yard Oceanco to a design by Igor Lobanov, Jubilee was first delivered in 2017 as the largest yacht built in The Netherlands. Her interior was designed by Sam Sorgiovanni and accommodates 30 guests in 15 cabins. Four VIP cabins sit on the bridge deck, while a further 10 guest suites are located on the main deck. Jubilee also has an entirely private owner’s deck that enjoys unmatched views. Lürssen chief executive Peter Lürssen said refit work had become “a core business” for the yard. “I am very happy and proud that the owners of Jubilee have decided to have the refurbishment work done with us,” he said. Over the last year, Lürssen has received an increased number of yachts measuring between 50 and 100 metres for maintenance work. 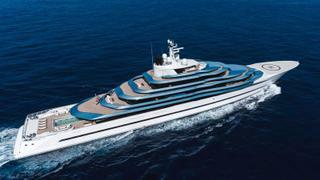 These include the 162.5 metre Eclipse, 93.25 metre Mayan Queen IV and the 138 metre Rising Sun.